I was a nobody growing up. Always the chubby kid with glasses and no friends. I had nothing in common with kids my age and I was bullied throughout most of grade school. Beat up, made fun of, you name it. I had no voice. I was no one. So my lifelong career plan since my childhood was to be a Civil Engineer, like my father. He was the owner of a successful company, and by accounts, an incredibly smart and hardworking man. He would show me how to be the best. I bought in. My path was set. Somewhere along the way, I found the game of basketball. Shaquille O’Neal was in Miami and I was an impressionable middle-schooler who still didn’t have friends, but at least I wasn’t bullied anymore. I was captivated by the spectacle. The breakneck speeds, the feats of almost inhuman athleticism – I was hooked, all because of Dwyane Wade. I watched because of him. He was the one contorting his body in mid-air, shooting his turnaround fade away that 12-year old me couldn’t understand how he didn’t fall after every landing. I longed to be a part of that spectacle. Even though I knew I could never. I would never be a part of what was happening on the hardwood. I was not Wade, or Brian Grant or Shaq. My height was average, and I was fat and nerdy. Regardless, I was fascinated by sports. And it was around then when sports began to consume who I was. It was a gradual transformation, but one I made. Sports has given so much to me. I have made lifelong friends because of them. The first person I fell in love with, I met playing volleyball. She forever has changed my life and who I am today. I now proudly call her my best friend. She’s made me a better person and in the hardest times of my life, she’s been there propping me up. When I have felt both hollow and empty, she has given me strength. I would have never met her if I didn’t like sports. I would have never met her if it wasn’t for Dwyane Wade. When I started college, I remembered my path. Engineering school – a piece of cake, I thought. I knew what was needed to be done in my industry, and I was going to do it, so I did it. I learned about fluid mechanics and properties of concrete. I memorized math formulas I really couldn’t care for and a bunch of other nonsense. It didn’t really matter because I hated it all. As semesters passed, my GPA plunged. To the point that the once nerdy chubby kid who always had good grades was a fat a**hole who got a letter from FIU telling him he had been dismissed from his school. I frantically searched for a purpose. I panicked, I didn’t know what to do. If I couldn’t do Engineering, then what else could I do? It was the path I had chosen since I could even remember. Back during career week when my dad used to have his presentation about bridges and roads, I always said that’s what I would do. If it wasn’t for my best friend who I met playing volleyball, I would have never come to the decision: To pursue a career in sports journalism. I had always wanted to be a part of what Wade was doing. This was a chance to do that. As indirectly as it may be, that’s how I rationalized it. So I begged counselor after counselor until they admitted me under a different major. I joined my university’s paper and started a small podcast in my kitchen. Today, I have a staff of nine and a podcast with over 60,000 listens. I found a purpose, I had a path. I loved sports. I wanted to be a part of it in some way. The panic, the elation, the spoils of victory and agonies of loss. It’s a beautiful high that only sports can provide. And now I am living it. All thanks to Dwyane Wade. He made me love sports. He wowed me and had my attention forever. I have seen Wade grow from a young man with a shaved head and no meniscus to a father, businessman and Hall of Famer with no meniscus. I got to be a part of that. Me, the one who had no voice, who felt like a nobody. So what was lost tonight was not just a player or a superstar, what was lost was a part of many people’s lives. He served as the springboard to realize my dreams. He made me fall in love with sports. Wade gave that to me. He made me notice. The connection Miami sports fans have with him is unlike most. I am 23, so anyone my age – slightly older or younger – has lived and grown up beside Dwyane Wade. We have all watched him grow as we ourselves have matured into adults. While he found his footing as a player and as a man, we found our footing into adulthood. As far back as I have been a sports fan, he has been there, from the very start. I do not know what it’s like to watch the Heat without Dwyane Wade. I don’t know what it’s like to be a sports fan without Dwyane Wade on the team I watch and cover. That world has never existed. So tonight feels like a punch to the face. He’s now gone. I won’t get to see him every other night and he won’t play home games in Miami anymore. There’s a good chance I won’t be able to attend his last game because it might very well be in Chicago. My love for sports outlived the tenure of the athlete that sparked it. And while that is an obvious thing to say, it’s kind of like death. You know one day it will happen, but a part of you can’t imagine it happening. I always knew one day Dwyane Wade would retire or play somewhere else, but that doesn’t ease the pain one bit. Flash, you were amazing and without knowing you, I love you. You helped me find my way. I will never forget that. Thank you for all you gave me. And I hope to one day cover your jersey retirement. It would be coming full circle. I have my voice, finally. And the day I realized it, the one who helped me realize it, is gone. Thank you. You are the greatest I have ever seen, forever and always, my sports hero. 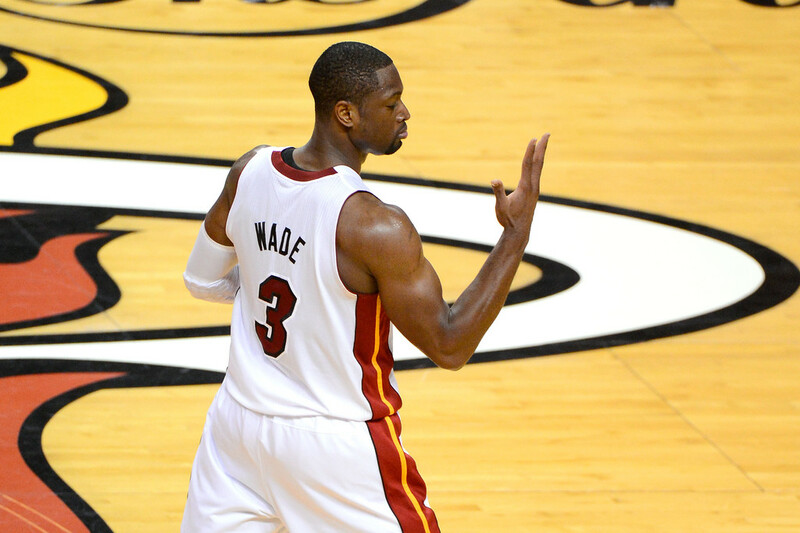 Trojan Horse: Could Wade's Interest In Free Agency Be Part of A Master Plan?